Spanish Fort Middle School teachers, from left, Beverly Floyd and Cheramie Jordan gather in front of the Christmas Tree at the United States Sports Academy this past week after dropping off toys donated by their school. Students at Spanish Fort Middle School have embraced the true spirit of Christmas by helping other children who may not be as fortunate at this time of year. Students from the school donated more than 350 toys to the United States Sports Academy during this past week, including one individual who donated more than 120 toys by herself. 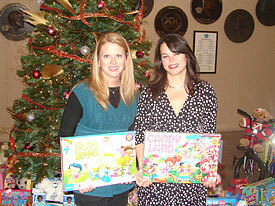 The toys will be forwarded to Salvation Army and distributed to area children this holiday season. The Spanish Fort Beta Club organized the toy drive for the school. The Beta Club promotes high academic achievement and encourages service to others while developing character and leadership skills. The Academy will continue to accept toys from the public through Christmas Eve from 8 a.m. to 5 p.m.